This is not, at all, to put Gloria down: we all forget (perhaps it's an act of kindness) the gale force of those adolescent pangs until the trigger of records like this one. The full meaning of it came to me when I saw, about four nights running, the great New Jersey acappella group 14 Karat Soul perform it in Glasgow c.1983: the bass, "Briz" (?) loomed as the lead sang, one last time, of his yearnings, intoning over him those doomy notes that spelled out just one thing: You're alone, Bub; get used to it. The bass was reality, just as he often takes over on "baser" group sides (Pookie for the dreams; Gerald for the down'n'dirty), and his notes here were a death knell for the lead's tattered vision of togetherness ("Maybe she'll want me... "), a bell to toll him back to his sole self, alone in the less than tender night. Briz was singing right into his face, with a sort of evil glee: maybe this message from the Reality Zone had to be given, but he was certainly enjoying the task, and the "teenage" lead was not much liking it, protesting his love and need to the end (similarly, is that last "Gloria!" on the Cadillacs' version - can't remember if same for Passions' - about acceptance of the situation, or a refusal to give up hope?). This collision of dreams and reality, with that particular performance and image of the bass singer quashing all hope, were very much in my mind as I shaped my play which took Golden Teardrops as a title, and the distinction I've made in this posting (ie inc. Pt. 1) between Gloria and GT comes, I can see, from the way I employed the songs there. As a teenager, the protagonist does exactly the same as in Kat ... newly accepted into a group, he sees a girl walk by and launches into Gloria: "It wasn't her name but it was her." Do you now see why I'm impelled, at least for the moment, to go on with this correspondence? Because there is so much of it - correspondence in our writing, that is. Which suggests we're trying in our different ways to work the same things out, and that in turn makes it likely that as we're connecting then others, whether content to look over our shoulders or join in, are too. This is a bit of a digression from what I was going to expand upon in the play, but in a way this dialogue is a mirror of the doowop process: the initial, half-formed idea (vague thoughts of composing a song); the need to be inspired to greater heights by someone else (the group); the need for a wider connection, touching other lives (records and performing). Maybe if I could carry a tune I wouldn't need to do all this but, as you say, the member of the audience has a role to play, whether it's bringing their rapt attention to the concert hall or - but this is the same thing, really, isn't it? It's saying to those groups: We really listen. And we care. Going back to 14 Karat Soul, maybe nobody else apart from the other group members noticed the night that the lead really tore into Annie had a Baby during that residency in Glasgow, making it a cry of anguish that far surpassed Hank Ballard's version, when I eventually heard it. But I was there. I did. Go to the start of this blog for a brand new post about 14 Karat Soul and a mysterious onstage gesture. 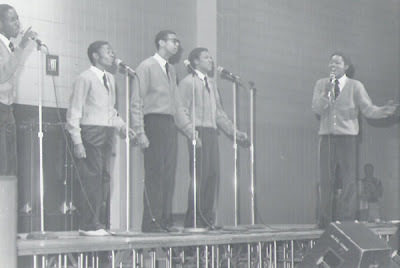 Image from Beaudaddy's vocal group site. IMPORTANT: Beaudaddy's site links to what had been the official site for the later incarnation of the group, which includes the wording 14ksoul and dot and com. This was legit (I've opened it in the past) but recently I have received several anti-virus warnings when trying to open it. So don't do it.